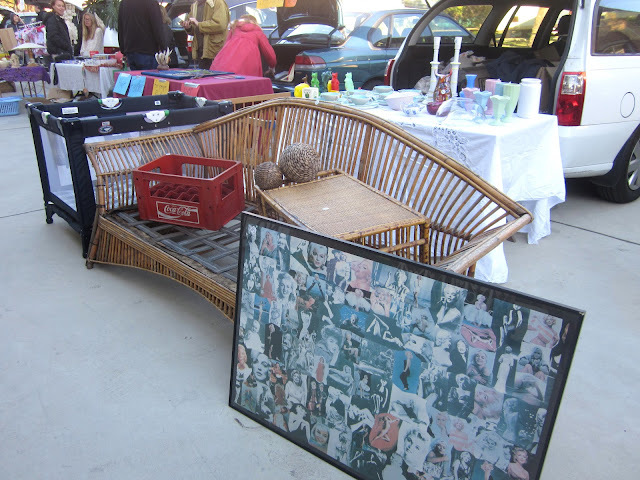 Have You Heard The One About the Day I went to a Car Boot Sale? The local school had a car boot sale last weekend and I saw it as an opportunity to clear away some of my unwanted vintage. I eagerly booked a spot. It was a fantastic day and I hope the school has one every six months or so, after the success of their inaugural attempt. Some funny things happened during the morning. The first of which, was when the neighbours of the previous owners of this cane lounge identified it as having been on their verge for a recent council clean up. Yes that would be me who dragged it's vintage arse into the back of my car single handedly. It was in pretty bad shape and needed a major overhaul, but I managed to get $35 for about 10 minutes work. I am glad the Marilyn collage went to a good home too. She has been with me since my university days, but she just didn't fit into the Beach House and I'm sick of hiding her behind the furniture. The coke crate was probably a gift at only $5, but it did have splits down either side and I found her road side. She did make someone happy though and it didn't come back home with me either. The breakfast tray left me too.... I've used her in lots of shoots on here, but she was going off under the house in storage, so it was time. Those little wicker bedside tables, I could have sold many times over and they were probs too cheap as well, at $5 a piece. The lady who bought those wants to match them with one of those wicker 70's bed heads in the same style, so I wished her luck and she was on her way. I once had great aspirations for the little wicker rocking horse, another roadside find. I have seen them priced upwards of $300 restored, and they look fantastic in a baby's nursery. She went out for a song at $5 as well. I had $15 on her for most of the morning. There were lots of tire kickers, but no bites until I dropped her price. The Poole Pottery was not a great coup. I paid way too much for it at a deceased estate auction years ago. But I wanted her to be gone, so practically gave the whole set plus, the chafing dish away for $25. The funniest story of the day was inspired by the wily old dame next to me, who was a seasoned pro marketer. I arrived at 6am, had her life story in the can by 7am. She started buying some of my stuff too, saying she was going to gift it to various people. She bought a large sailing boat wall hanging from me early in the piece. So early in fact, that I don't have a shot of it. The Beach House Brat no longer wants a red, white and blue nautical bedroom, much to my disappointment, so I am off loading the stuff I have collected for that. She paid me $5, which is what I bought it for at a garage sale and put it on the opposite side of her car to me. Well blow me down, if not half an hour later, I saw a guy walking off with it. Yes that's right she had sold it for $15. All part of the cut and thrust of market forces I guess. So this is all I had left at the end of the event. The vintage school desk went after this photo too, so I pretty much sold out. I managed to sell my pram and a porta cot too. 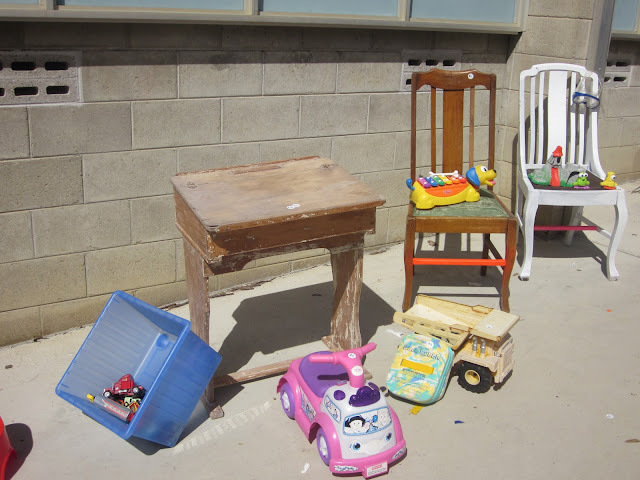 They were in pretty good condition and although they were sold at about a 95% discount, it was better than throwing them out. 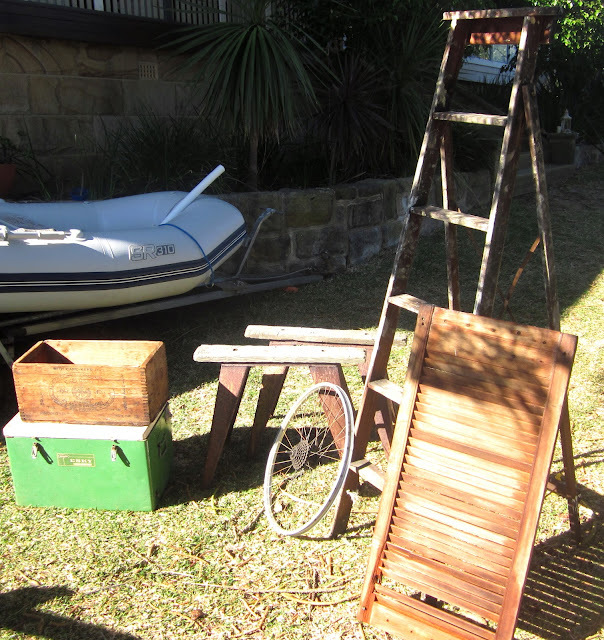 I have learned over the years that unless you sell things at bargain prices, you end up taking them home. I can understand that, as it's how I like to buy as well. I think it's better to sell out and make some money than make the same money by selling a few things, but still be left with lots of your unwanted stuff at the end of the day. 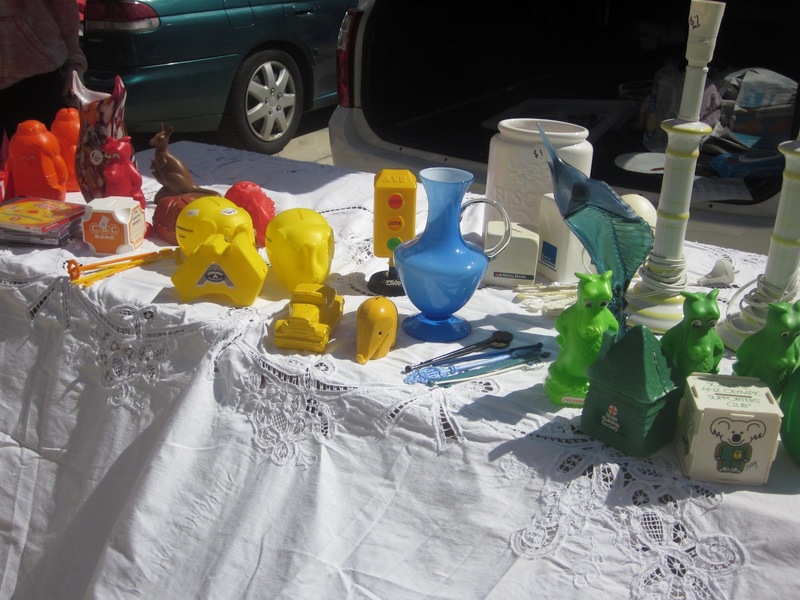 Towards the end of the morning, when I had not much left to sell, I dragged out the vintage money boxes, which I thought were pretty collectable when I bought them at a garage sale, but they are moving slowly. These's a bit of AVON vintage in there as well. It was such a great day and lots of people asked me if I had a shop, as I had such terrific stuff and was I a professional marketer. The answer to both was no, just a keen collector, who likes to mix it up a bit. So on the back of my enjoyment of the sale and in readiness for the next local event, I have been out scavenging this afternoon. 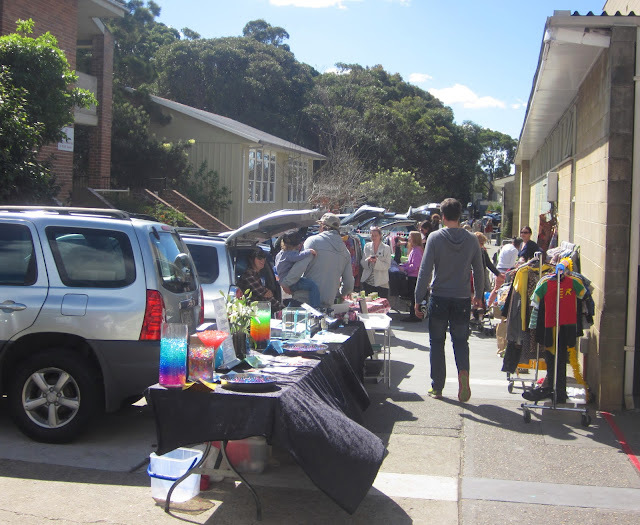 The car boot sale was coordinated with the regular council clean up so there are piles of junk out the front of lots of houses, all to be collected this week. Here's what I found on a quick drive by. I reckon there's well over $100 worth of junk here. 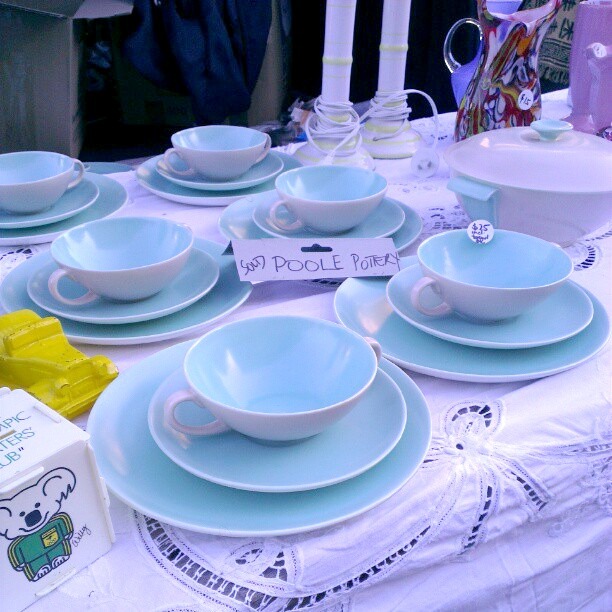 Not bad for half an hours work and you'll be seeing these again at the next car boot sale. Hope you are all having a lovely week. Happy vintage hunting. I like your new finds, if I lived closer I would come and buy a couple of those things off you! Oh Carolyn, that makes my heart sing (not the sailors). I am addicted to collecting stuff. I loved the vintage desk , wish I had known you had that hidden away. The sailor and I cleared out some junk last Saturday put it on the footpath and 5 mins it was all gone, Working from home on Tuesday I look out the window into the neighbours back garden and there I spied the wrought iron garden setting I put on the footpath, all sitting pretty with lovely bright cushions. Hmmmmm sweet! I was so tempted to drop by that sale - just didn't get around to it - damn! Can't wait for the 'junk' to start appearing round me. My boys hate it - the drive home from school takes twice as long. 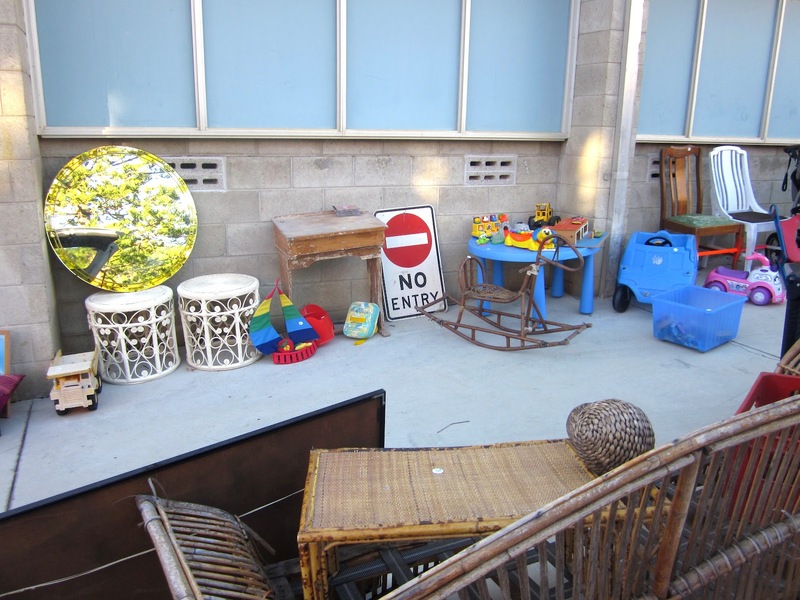 This time I'm co-ordinating a street garage sale with our clean up - who knows what I'll pick up! I can't believe you sold that cane lounge for $35 - what a bargain. Hey Carolyn. Sounds like you had a pretty eventful day and I love, love your new finds! Hi Carolyn, I love the vintage desk! Too funny that your market neighbour profited from your merchandise (wily indeed;). 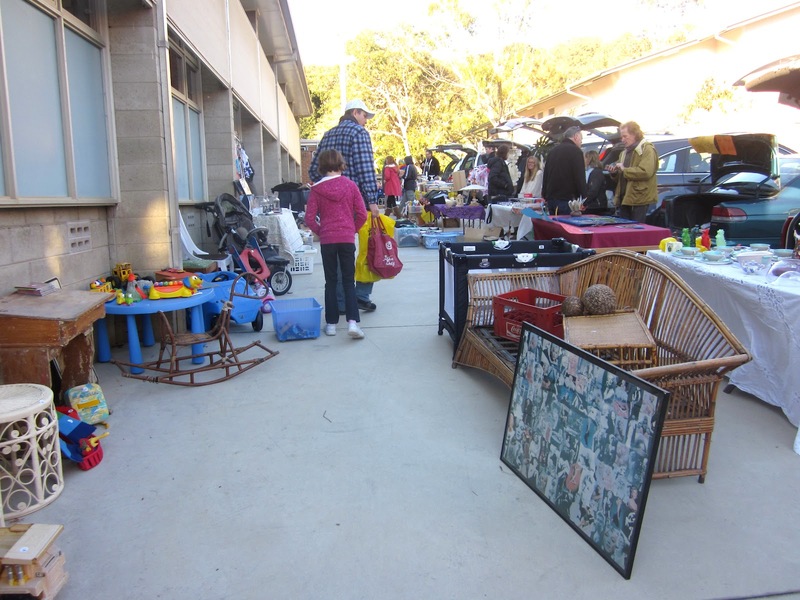 It sounds like you had a fun and successful boot sale! What a cack - cheeky old bird! I would have had a couple of those things - loving anything bamboo at the moment! I could sell about ten boot loads of stuff myself - didn't know we did car boot sales here in Oz. My husband always talks of them in the UK. We do not have car boot sales here in South Carolina, USA. We used to have an antiques mall that had them three times a year and I really enjoyed them. I cannot believe the deals on your wicker pieces. I really enjoyed reading your post - it was very entertaining!